What Are The Best Fly Sprays For Horses In 2019? What Are The Best Fly Sprays For Horses? Ahh, the summer… bringer of lovely long evenings for hacking, warm sunny days for competing or rides with friends – and of course, the flies. Every horse owner’s nightmare! 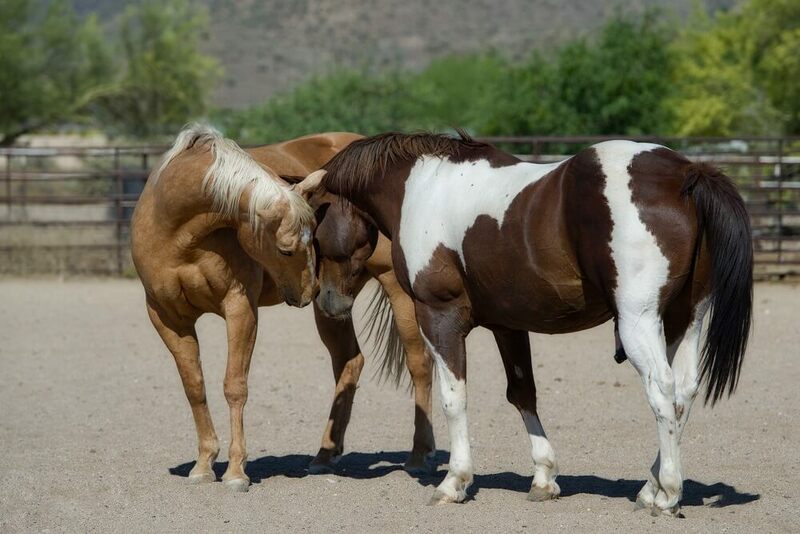 An infestation of these little biting irritants can turn even the most docile, placid horse into a bucking bronco, and it’s not surprising. Flies can be incessant, and as we all know they can bite and itch like crazy. Imagine having no fingernails to scratch, and no hands to swat them away! Your horse has to make do with what he’s been given – but luckily he’s been given YOU, and there is plenty you can do to make his life more comfortable. Fly sprays, together with fly masks and fly sheets, are one of the best and least intrusive ways of getting rid of flies that are plaguing your horses. There is a huge selection of different fly repellents available, so it can be hard to know which one to go for. 2.1 1. Is horsefly spray always effective? 2.2 2. Is it all right to use horsefly spray on an ungroomed horse? 2.3 3. Is horsefly spray safe to use? 2.4 4. What’s the best way to store and use horsefly spray? 2.5 5. When is the best time to apply horsefly spray? 2.6 6. What’s the best way to apply horsefly spray to a horse’s head? 2.7 7. Can you use fly spray around an injury? 2.8 8. How often should you use horsefly spray? This is a great all round spray, perfect for getting rid of flies, ticks and other biting parasites. As well as repelling flies, the Wipe ‘N Spray will condition the coat as it contains Lanolin. You need to follow the name, and wipe it into the coat, not just spray it, for best results. The flies will then either land on the horse and die, as the active ingredient poisons them (don’t worry, it’s non toxic for your horse) or else they won’t land at all. Very effective: Kills and repels a wide variety of biting insects. Nice scented: Citronella scented, so your horse will smell delicious! Leaves the coat shiny: It is good for adding a gleam to manes and tails. Longevity: Promises a good few days worth of protection. Possible irritation for some horses: Some horses have had irritated reactions to this product, so it’s best to do a small patch test before you smother yours all over. Grease: Can be a bit greasy, so dust and dirt can get stuck in it. 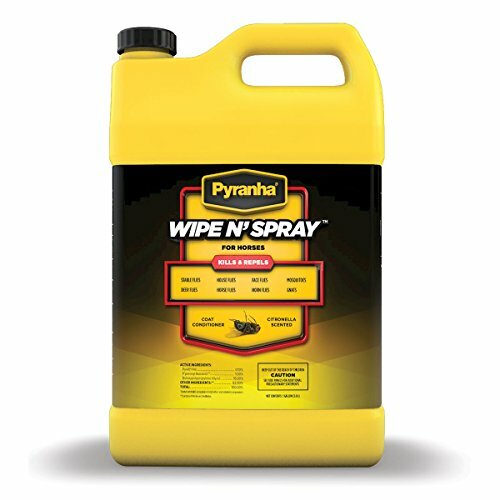 Wipe ‘N Spray is a highly effective fly spray that lasts a good long time. The fact that you have to rub it in also makes it suitable for nervous horses who don’t like being sprayed, and it’s perfect for the face and around the ears. If you are looking for value for money in a product that actually works, then look no further. This is an absolute powerhouse of a fly spray. It not only repels flies, mosquitos and ticks, but it kills them on contact with your treated horse. It has a really good duration, being effective for around 17 days, which is unheard of! It is also sweat proof and weatherproof, meaning that it will still be doing its job come rain or shine. Using this spray means that you will be able to enjoy long rides without worrying that the sweat will have washed off the fly spray and by the end of the ride you will be trying to sit on a dancing circus horse. Longevity: The long duration and the fact that it is sweat proof is a definite hit. Sun protection: Contains two sunscreens, adding to the protection still more. Ready to use: No mixing required. Effective: Strong formula repels all kinds of insect. Grease: It’s very oily, so try not to get it on any clothes that are not yard clothes. More frequent use may be needed: Some horses may need more frequent applications. For a heavy duty, long lasting fly repellent that is resistant to rain and sweat, this one has no rival. You can just spray it on one day, then not have to worry about re-applying for days and days! It is worth keeping an eye on your horse though, in case the 17 days protection runs out a day or two before and he gets uncomfortable again. Also, bear in mind that Bot flies barely need to touch the horse in order to lay their eggs, so it might not work so well at repelling them. Always keep an eye on the legs and remove and Bot eggs as soon as you see them. This is another sweat resistant product, which is what you want if you’re out on long rides or if your horse is doing anything much more than standing about in the field. The secret of this is an ingredient called Repelock, which clings to the shaft of the hair so it won’t be washed away by sweat. Endure can provide up to 14 days of resistance – but it is worth knowing that this takes a bit of time to build up. You can’t just spray it on once and expect a fortnight of protection; you have to have a few days of use before it is able to last for a long time. Effective against flies: Protects against a large variety of different flying biting insects. Additional protection: Reportedly repels even Bot flies. Repels ticks: Repels ticks that can carry Lyme disease. Can cause irritation: You need to be careful not to get it on your skin or in your eyes. An oily consistency: It can encourage muck build-up. Endure’s sweat resistant product can help you have fly-free, stress-free rides, and can protect your ponies from the bane of the summer months. If you have a sweaty horse, or one with a particularly active schedule, then this is the fly repellent for you. It is a strong fly spray, but it is also reportedly safe to use on large dogs as well as horses, meaning that all your four legged friends can be protected. 1. Is horsefly spray always effective? Different types of horsefly spray are more effective on some equines than on others. Various types may be more effective in one climate or type of weather than another. The best way to know which type of horsefly spray to choose for your horse in your setting is to talk with other horse owners in the area and find out what works best for them. Of course it’s always a good idea to consult with your veterinarian and talk with the staff at your local feed store. Aside from that, the way that you apply horsefly spray has a big effect on the efficacy of the product. 2. Is it all right to use horsefly spray on an ungroomed horse? For the very best results, you should have your horse clean before you apply fly spray. Getting loose dirt and hair off also prevents simply losing product as these things fall off when the horse moves around or rolls on the ground. Brush your horse lightly after application to ensure even distribution of the product. 3. Is horsefly spray safe to use? Remember that all fly sprays are pesticides. Even those that claim to be organic or made of entirely natural materials are still irritants. For this reason, you should protect yourself against coming in contact with them. It’s a good idea to wear a long sleeved shirt, disposable gloves and goggles when spraying to avoid contact with your own skin and eyes. You may also wish to pull a bandana over your mouth and nose to avoid accidentally inhaling the product. Always stand upwind of your horse while spraying. Don’t spray into the wind. 4. What’s the best way to store and use horsefly spray? Keep your fly spray in a cool, dry, dark place. Protect it from the elements to ensure maximum efficacy. Before using your spray, shake the bottle thoroughly because effective ingredients may have settled to the bottom. 5. When is the best time to apply horsefly spray? It’s a good idea to spray your horse before you turn him out for the day. Give the horse a good grooming and then leave him protected against flies. If you plan to spray your horse before riding, groom him, tack up and then spray the exposed areas of his body. Having fresh horsefly spray under the saddle could be irritating to your horse’s skin. 6. What’s the best way to apply horsefly spray to a horse’s head? Some horses will allow you to spray gently around the face and head. If this is the case with your horse, cover your horse’s eyes (one at a time) with your gloved hand and spray lightly around the head and ears. If your horse will not tolerate this, apply the spray to a soft cloth and wipe his head and ears. 7. Can you use fly spray around an injury? It’s best not to use the spray formula around an open wound. Instead look for a fly repellent salve such as SWAT. This product can be applied in a circle around the wound. You may also wish to apply light gauze bandaging over a wound to prevent flies. 8. How often should you use horsefly spray? Frequency of application depends on the type of product you’re using. Some concentrates can be applied monthly with light touchups around ears, face and legs throughout the month. Other products need to be applied daily. This is especially true of mild products such as pyrethroids, pyrethrum and organic or homemade products. Be sure to read manufacturer’s instructions thoroughly and follow them carefully. Imagine being a horse – no way to get away from the biting flies that are driving you crazy. In the wild they could gallop across plains or move grazing till they found somewhere that was less infested, but this is not possible for the modern horse. He has to rely on you for his fly protection, so make sure you get him a good one that suits his needs. For an all-round great spray for horses who are prone to dry or irritated skin, or those who don’t like being sprayed, Pyrana Wipe ‘N Spray is ideal. If you are looking for a long lasting fly repellent for hot, sweaty rides, the Absorbine Ultrashield is the one for you. This one is also great for areas that are prone to rain as well as flies, as the spray will not easily wash off. 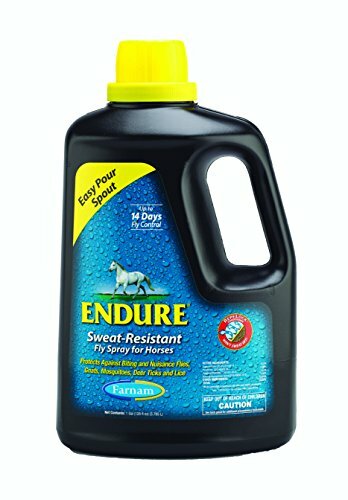 Endure Sweat Resistant is the spray you want if you are looking for one that will repel a huge variety of insects from your sweat-prone horse.